At Pantagone Satellite, we are a team of professionals committed to provide the highest quality products to our valued customers. 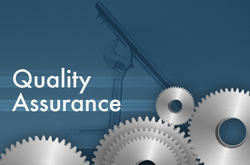 "Regarding quality as our Lifeline and customers as our God" is the principle we always adhere to. Inspired by such a quality driven attitude, we follow a stringent quality control policy at our company. A dedicated Quality Control Team thoroughly checks the quality of each and every product, right from the raw material selection to finished product testing. As a result, we never fail to achieve the ultimate goal of our business- total customer satisfaction. Owing to our rich domain experience and the use of best quality raw materials, we have been able to offer premium quality telecommunication equipment. To offer the best products, our quality controllers check the offered equipment on several of their checkpoints. The equipment we offer is appreciated for its attractive design, simple functionality, hassle-free operation and market leading price. Apart from this, our ethical business policies, flexible payment options and time stipulated delivery place us among the prominent names in this domain.